Peter L. Agovino is Of Counsel at the Firm. 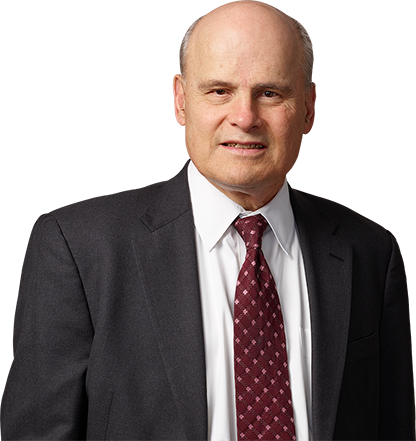 He was the former Co-Managing Partner of Agovino & Asselta, LLP. Mr. Agovino’s practice concentrates in all aspects of construction law, and has more than 30 years’ experience in representing contractors, materialmen, owners, design professionals, and financial institutions in the formation and enforcement of complex construction agreements. He has substantial experience in trials, alternate dispute resolution proceedings, and in negotiating settlements of contract claims. Mr. Agovino has obtained substantial recoveries for contract breaches, unforeseen subsurface conditions, disputed or extra work, and impact costs for delays and acceleration. In a major victory for contractor’s rights, Mr. Agovino, as lead counsel in Abiele Contracting, Inc. v. New York City School Construction Authority, 91 N.Y.2d 1, 689 N.E.2d 864, 666 N.Y.S.2d 970 (1997), successfully appealed and overturned the mandatory default termination procedures implemented by the New York City School Construction Authority. Mr. Agovino also represented a Wick’s Law electrical contractor in Eaton Electric, Inc. v. DASNY, 21 Misc.3d 1135(a), 875 N.Y.S.2d 820 (Sup. Ct. Kings Co. 2008), in which the contractor recovered substantial delay and acceleration costs arising from the owner’s issuance of defective plans and specification and its failure to coordinate and schedule the project work. Mr. Agovino began his career as a law clerk for the Honorable Mark A. Constantino, United States District Judge, Eastern District of New York.